But not the Cato Institute, you betcha! Cato senior fellow Randy Barnett is the subject of the Wall Street Journal's nearly-full-page Weekend Interview. 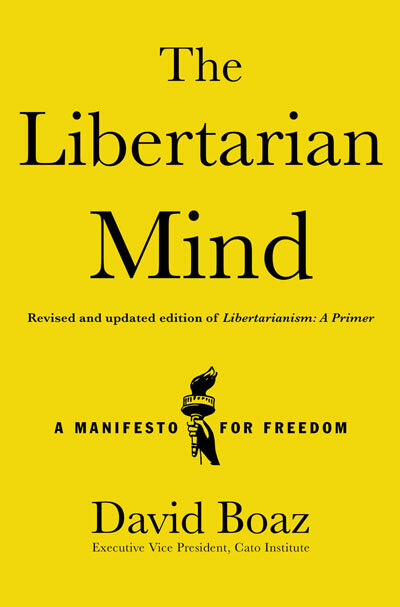 Randy talks about interpreting the Constitution with "a presumption of liberty," the subtitle of his book Restoring the Lost Constitution; about the Supreme Court's expansion of government power from Wickard v. Filburn to Gonzales v. Raich; and especially about the constitutionality of the new health care bill and its individual mandate. Randy wrote an amicus brief with Cato in support of the Virginia attorney general's challenge to the health care mandate. "What is the individual mandate?" Mr. Barnett says. "I'll tell you what the individual mandate, in reality, is. It is a commandeering of the people. . . . Now, is there a rule of law preventing that? No. Why isn't there a rule of law preventing that? Because it's never been done before. What's bothering people about the mandate? This fact. It's intuitive to them. People don't even know how to explain it, but there's something different about this, because it's a commandeering of the people as a whole. . . . We commandeer people to serve in the military, to serve on juries, and to file a return and pay their taxes. That's all we commandeer the people to do. This is a new kind of commandeering, and it's offensive to a lot of people." For the full legal argument, read the brief. President Obama signed into law on Wednesday a sweeping expansion of federal financial regulation.... A number of the details have been left for regulators to work out, inevitably setting off complicated tangles down the road that could last for years...complex legislation, with its dense pages on derivatives practices.... “If you’ve ever applied for a credit card, a student loan, or a mortgage, you know the feeling of signing your name to pages of barely understandable fine print,” Mr. Obama said. The Safe and Secure Internet Gambling Initiative is running this ad on the web: Good point, as Cato has noted several times. But let's see . . . alcohol, internet gambling -- can you think of any other area where prohibition hasn't worked? Give up? Click here or here. Michael Gerson, who wrote the words that created the George W. Bush administration and thus led to the sweeping Democratic victories in 2006 and 2008, once again warns Republicans to stick to big-government conservatism and avoid the siren song of small-government libertarianism. This time he describes libertarianism as "a scandal" because it "involves not only a retreat from Obamaism but a retreat from the most basic social commitments to the weak, the elderly and the disadvantaged, along with a withdrawal from American global commitments." That is, he charges libertarians with a "retreat" from a welfare-state philosophy that is at odds with the American tradition and with basic principles of limited government. Moreover, he charges us with wanting to change a set of policies that have not served the weak, the elderly and the disadvantaged well, because they have encouraged and promoted weakness and long-term dependence. Libertarians warn that to continue down the current road leads to the Greek crisis, in which the utter cruelty of making promises that can't be kept is revealed. The state will soon have to retreat from the unsustainable commitments and promises that politicians and pundits are blithely making now. Gerson also charges libertarianism with "rigorous ideological coldness." He considers reason, arithmetic, and a realistic assessment of what those "commitments" really mean to be "cold." That tells more about him than about libertarianism. As for the "global commitments" that Gerson writes such beautiful words about, the real scandal here is that our soldiers have been put in harm's way all over the world, fighting other people's battles and deploying deadly force that inevitably kills the innocent, the "collateral damage" that advocates of "global commitments" so conveniently forget. And more broadly, we are all at risk when U.S. foreign policy involves America in foreign quarrels and encourages hatred and terrorism in response to our foreign interventionism. Gerson's warfare-welfare state philosophy has given America two wars, serious threats from terrorism, and a $106 trillion unfunded liability. It might be kinder and gentler to try the Founders' vision, the libertarian vision, of a limited state that provides a framework in which we can all enjoy life, liberty, and the pursuit of happiness. As we noted in the original draft, Gerson was the intellectual architect of Bush's "compassionate conservatism," which came to be better known as "big-government conservatism" -- from Bush's 1999 Indianapolis speech that Ed Crane criticized in the New York Times as "Clintonesque" (worse, he meant Hillary) to his unReaganesque inaugural address to his speeches advancing such triumphs as No Child Left Behind, the Medicare prescription drug program, subsidies to religious groups, the Iraq War, the Bush doctrine, and massive increases in foreign aid. Thus he can also be seen as an architect of the Democratic victories in 2006 and 2008, in which the ideas and policies that he helped to shape were rejected. Now he warns Republicans that they shouldn't fall for small-government ideas just because their big-government agenda led to a Democratic White House and Congress. Here's a response to a previous Gerson attack on libertarianism. But the rumors are based only partly on fact. Although there is a new tax, it will not apply to everyone, and existing tax breaks for home sales will remain in place. The Health Care and Education Reconciliation Act of 2010, which President Obama signed into law March 30, is comprehensive and complex. Section 1402, "Unearned Income Medicare Contribution," imposes a 3.8 percent tax on profits from the sale of real estate -- residential or investment. But the levy is aimed at high-income taxpayers, leaving most people untouched. And it will not take effect until Jan. 1, 2013. Let's look at the facts of this new law. First, it is not a sales tax, nor does it impose any transfer or recordation tax. It is called a Medicare tax because the money received will be allocated to the Medicare Trust Fund, which is part of the Social Security system. Next, if your adjusted gross income is less than $200,000, you are home free.... How is the tax calculated? Through a complex formula that could be called "the accountants' protection act." As a taxpayer, you (or your financial adviser) must determine which is less: the gain you have made on the sale of your house, or the amount by which your income exceeds the appropriate threshold. So let's recap here. Post contributor Benny Kass promises to "debunk" the "rumors" that "the health-care legislation Congress passed this year will impose a sales tax on all real estate sales." And he concludes, "In the meantime, don't believe the rumors." But in fact the health-care law did include a new tax on real estate profits. It's not exactly a sales tax, and it won't apply to most people. But the only real inaccuracy in the "rumors" that he said "are flying" was the word "all." It's only a 3.8 percent tax on some real estate sales, no doubt only a minority of sales, though perhaps affecting more readers of the Washington Post Real Estate section than people in less-affluent regions where housing prices didn't soar and then remain high. Frankly, I've seen more effective debunkings. This "rumored" real estate tax is also discussed on page 20 of Michael Tanner's new study "Bad Medicine: A Guide to the Real Costs and Consequences of the New Health Care Law." But if you're really going to try to understand the new health-care legislation, you may want to clip the Kass article to keep with your copy of the Tanner paper, as no one study can guide you through every detail of a 2000-page law. Journalists and HR experts will be kept busy for years tracking down every sub-reference and interaction in the bill. The estimable Francisco Marroquin University in Guatemala has just posted 15 hours of interviews with F. A. Hayek, conducted in 1978, four years after he won the Nobel Prize for Economics. You know the interviewee is important when the interviewers include James M. Buchanan, Robert Bork, Armen Alchian, Axel Leijonhufvud, and Leo Rosten. Along with the streaming video, there's a complete transcript posted. What an amazing resource! We are indebted to Armen Alchian, Bob Chitester, the Earhart Foundation, the Pacific Academy of Advanced Studies, and now Francisco Marroquin for making these interviews available. A few years later Cato Policy Report published two exclusive interviews with Hayek, in print form. Find them here and here. The three most prosperous large counties in the United States are in the Washington suburbs, according to census figures released yesterday, which show that the region has the second-highest income and the least poverty of any major metropolitan area in the country. Rapidly growing Loudoun County has emerged as the wealthiest jurisdiction in the nation, with its households last year having a median income of more than $98,000. It is followed by Fairfax and Howard counties, with Montgomery County not far behind. Mamas, don’t let your babies grow up to be cowboys, Don’t let ‘em make software and sell people trucks, Make ‘em be bureaucrats and lobbyists and such. Mauro's source for this conversation was Whalen's autobiography, Mr. New York. America is not fascist Italy, much less Germany or Russia. We have only the late Mr. Whalen's word that this conversation took place. But historians should be able to talk rationally about similarities and parallels in disparate programs. I opposed this war in 2002. I will bring this war to an end in 2009. It is time to bring our troops home. I was opposed to this war in 2002….I have been against it in 2002, 2003, 2004, 5, 6, 7, 8 and I will bring this war to an end in 2009. So don’t be confused. The right wing may be addicted to war, but it seems to be a left-wing president who's on the sauce now. I look forward to seeing the Center for American Progress start asking President Obama when it will be 2009.